When you really have no more space left to write on thosep ieces of paper, REcycle. When your seedlings have outgrown their yogurt pot nursey, REcycle. After enjoying a cup of tea, REcycle the teabag to make compost. 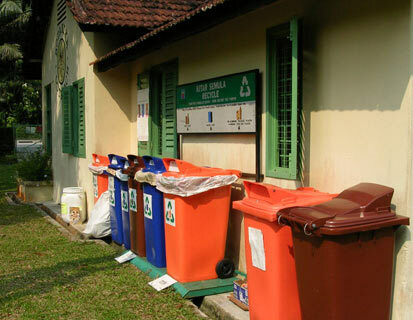 Find out REcycling facilities at Botanika Outreach (opposite Moongate), near the Penang Botanic Gardens. Aim for zero waste. Think before you throw. Can you REuse? REpair? Or compost? Watch the size of your rubbish bin REduce. Purchase a compost bin from us at a reasonable price. Is there another side to the paper you can REuse for lists? Open your post with care and REuse the envelope. Grow some seeds in old yogurt pots. The list is endless. Use your imagination. A stitch in time not only saved 9: REpairing can result in less plastic being manufactured, the destruction of rainforests slowing down, or community repair shops remaining in business. Out shopping? Say NO to plastic bags. Buy a cotton bag for your daily marketing. REfuse to take home mroe plastic bags. REuse any plasticbags you may already have. At the Society, we've had several workshops, talks and impromptu conversations regarding the joys, wonders and mysteries of composting, and there are many more planned. For those of you who are not able to dig a large pit in the back yard, and would prefer a more manageable way of recycling your organic material, or are just stuck with a balcony in your apartment block, we have the perfect solution for you. Sturdy, easy to use, clean, non-smelly bins for composting your Kitchen and Garden organic waste. Standing only 2.5 feet high and possibly 1 foot in diameter, and only RM30 , These bins are recycled plastic drums, with small holes drilled for aeration, and a lid on top to keep out the rain The compost bins come with a booklet, explaining everything about the composting process and if needs be, some top soil and if you're lucky a couple of worms to get you started. If you're ever in need of any grass, or leaf material, you know where to come .. A perfect size for gardens, and even apartment balconies. A large screw on lid to easily put in your organic material as well as dig it out, strong handles on the side to enable you to move it around. Composting is an art as old as time, and it is as relevant in today's modern high-speed hi-tech world as it always has been. Composting is the keystone of organic gardening. It's very simple but it seems like magic. You throw all your kitchen and garden rubbish onto a heap or into a bin, add a bit of muck and maybe one or two extra tiny creatures and they will convert it into crumbly sweet smelling stuff that plants can grow on – amazing! If you use a good variety of soft and tough materials, and watch temperature, air and moisture, you should get excellent compost every time. Beginners to composting should turn their pile, or bin as often as possible, because it's a good way of checking what's happening. Sometimes the compost may break down rather unevenly , with some materials, decomposing very slowly. They may be too large, in which case remove them to go through another pile, or chop them further or split them by bashing with a hammer. Or you may have too much fibre for the amount of sappy material and you'll need to mix in more high-nitrogen material. Slightly rotted grass mowings or poultry manure are ideal. If you get slimy patches , your heap may be too wet as well as airless – in which case aerobic bacteria can't survive to work. You may have included too much dense, moist material such as grass mowings in one go, or without stemmy fibrous materials such as sunflower stem or moist straw in layers through the heap. Dry patches also mean a problem with aeration and moisture. Check the pile of materials and water any that are too dry before putting them back in the bin, packed down evenly. Cover the container with plastic to keep moisture in. If one side of the compost seems to dry out faster than the other, your container is probably not sited in the best place so you'll need to move it if practical, or insulate the more exposed side. Ryrie , Charlie ( 2001). Compost. UK : Gaia Books Ltd. Plenty of advice and help available for you, all you have to do, is fill it up! Please call or e-mail us with questions on the various recycling programmes.